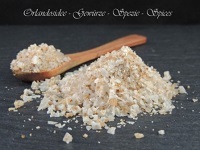 The fleur de Sel is mixed with a traditional recipy of barbeque spices from the Island Reunion. The mixture contains Caraway, Fenugreek, Coriander, Garlic and Sesame. Use it on red Meat, green vegetables or goose liver.